With it being Labor Day weekend here in the States, lots of people are on vacation, and vacation means road trips!! A familiar sight to most travelers this weekend will be those ubiquitous orange signs. 'Left Lane Closed Ahead', 'Workers Present', 'Prepare to Stop', 'Detour'. These signs mean waiting is ahead! :-D In Michigan, the old joke was that the orange traffic cones were the state tree. :-P As an homage to all the travelers out there this weekend, I decided to do a construction sign manicure! I used OPI Alpine Snow Matte as a base with Color Club Wham! Pow! over it for all nails but the ring finger, where I used OPI Ginger Bells as a base, with CND Electric Orange over it. For the black, I used American Apparel Hassid, and for the stripes on the traffic barrel, I used OPI Alpine Snow Matte with Sinful Colors Smokin' Hot over the white stripes to give them the 'reflective' shimmer, and Color Club Wham! Pow! for the orange stripes, with Sinful Colors Smokin' Hot over it for the reflective shimmer. Topped everything off with 2 coats of Seche Vite top coat. Gotta love construction, and it's seemingly EVERYWHERE in Vegas. Such a fun mani! I onced dressed up for Halloween as The Pretenders song "Middle of the Road"... all black with road signs here and there. The one on my hip said 'Danger Curves Ahead' and yellow stripes down my body. Orange cone hat, pretty funny. This is so adorable. The thumb and middle are my favorite. Love this construction is a Pita but this made me smile! Wow!! This is such a cute mani! I live in Vegas, too, and you're not kidding about the construction! OMG this is one of my favorites so far. Very original and accurate lol. Awesome! 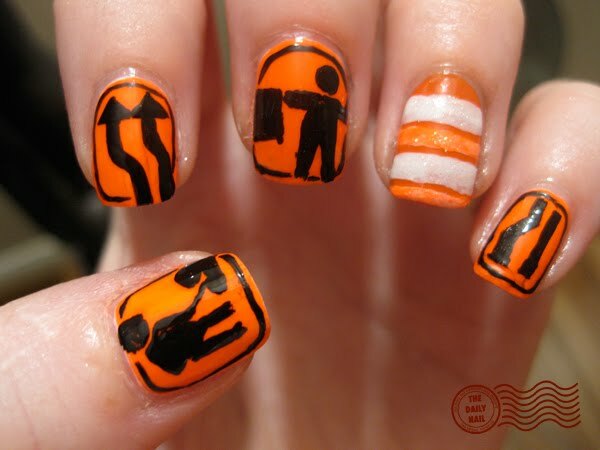 oh my lord, I work for the highway department, and I would LOVE to have these nails! I love the theme of your nails this week, how creative sweetheart.